Some of you have plans to throw a glamorous party or spend holidays in a luxurious destination. What's in your holiday to- do list? If I'm not wrong, then you've already completed holiday shopping according to your plan, and now you're eagerly waiting for the celebration. Some of you have plans to throw a glamorous party or spend holidays in a luxurious destination. But, some of you have also postponed your home buying plan to summer. Why so? Why not in this season? Is year-end home buying planning a totally dumb idea? According to Ken Pozek, a real estate agent at Keller Williams Realty in Northville. Mich, "If there is a for-sale sign, it's a welcome sign." Moreover, history says, every year in December, home prices will surely fall. And this year is not an exception. As per the study by recent report from Zillow,Ã¢U.S. home values are currently up 6.4 percent year-over-year and have been slowing for nearly two years. Next year home values are expected to grow at 3 percent Ã¢ roughly half of their current pace.Ã¢ This is probably a great news for all home buyers. 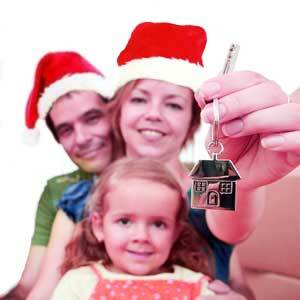 Lets see some reasons to buy a home in holiday season through this article. A group of people don't want to take a home buying project during the holiday season due to other various expenses at this time. Most people prefer shopping, catching up with family and friends, attending and throwing parties during holidays. The declining demand helps home buyer to get lower prices on their new home during festive season. On the other hand, buyers can get reduced price on pre holiday remaining house. New listing will come to the buyer with high price at the time of new year. You can get negotiable price from the motivated sellers who are still open to sell in this winter. You'll get less stress in the bidding process as there are less house buyers during this season. And less competition in market symbolize less price on items. Thus, you can save large amount of bucks on your new home buying. Meet with motivated sellers this season. In real estate market, motivated sellers are those who have failed to finalize the selling deal and are very desperate to sell the project at reasonable price before or during the holiday. As the unsold houses are still in the market for a few months, the seller will avoid unnecessary delay in the buying process. They are more flexible while negotiating for the deal. Moreover, if you're lucky enough, you can get few extra items such as window coverings, appliances etc. So, take this advantage and if you're not so picky person, then finalize your dream home during this season. Less market demand indicates less mortgage money. You'll get favorable mortgage terms during the holiday season. Generally, interest rate drops in December-January each year. Many lenders will offer low interest rate. Above all, sellers can cancel few fees in order to secure your finance. As you close your buying process before the end of the year, you may get more deduction on tax for that particular year. You may find deduction on your loan too. Try to consult a tax advisor to know the details about it. If you close your home buying project in year ending, then you can indulge yourself with whole family in summer vacation. Moreover, summer has other expenses such as back school, vacation, etc. So, if you really want to manage the whole process throughout the year, then winter home buying plan is the best. Here goes some tips for those who are planning to buy a new home in this holiday season. Be very careful while buying a new home in the year end. Tricky sellers may take the advantage of cold weather and snowfall to hide the defects. According to the experts Ã¢Snow covers a lot of things. Make sure you understand the landscaping and (feel assured) that the sellers aren't trying to hide something." Ask the retailer for the photograph which has been taken earlier to get an idea of the landscape. Thus, you can minimize some risks as well as retailers fraudulent acts. Saving hard earned money on a new home is really exciting. But remember, the process needs your attention to secure your money and the new property as well. Search online first and try to get an idea about rates. You may get variety of ideas from loan officers and sellers. So, do your homework in order to deal with them and judge their views. Don't rush while investing your money on your new home purchase. Try to access your purchase and find out if it is beneficial in the long term. If yes, then go ahead to your winter season home purchase project. Good luck!